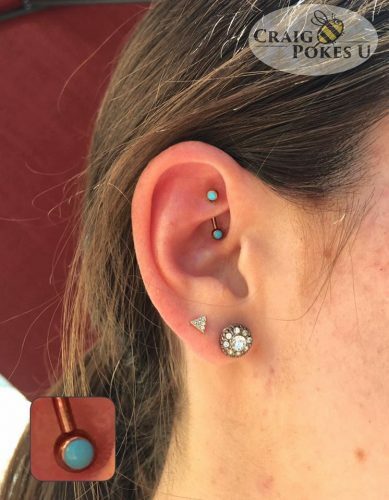 One of our lovely regulars dropped by to add another to her gorgeous collection of body piercings. 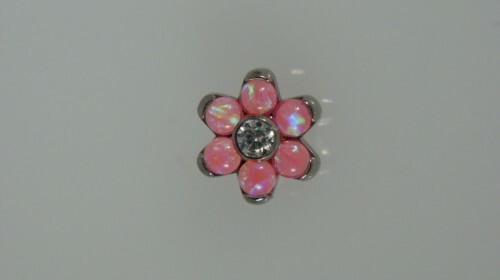 Pierced beside a well healed Turquoise curved barbell, we installed this beautiful Pink Opal Curved Barbell. 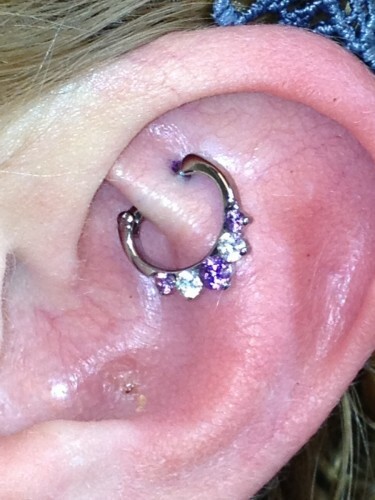 Set in implant grade titanium, we foresee as great a healing for this second piece as with the first. 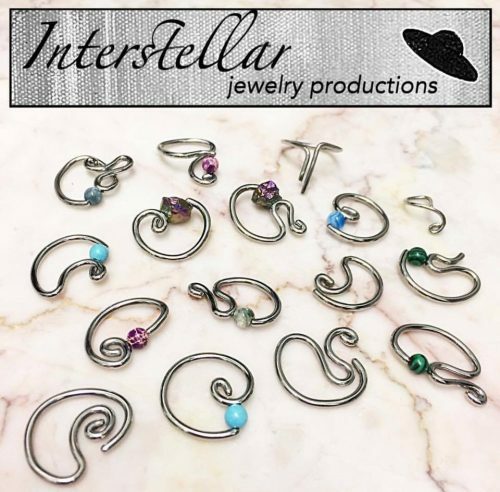 We are absolutely thrilled to announce the arrival of the incomparable Interstellar Jewelry Productions pieces. 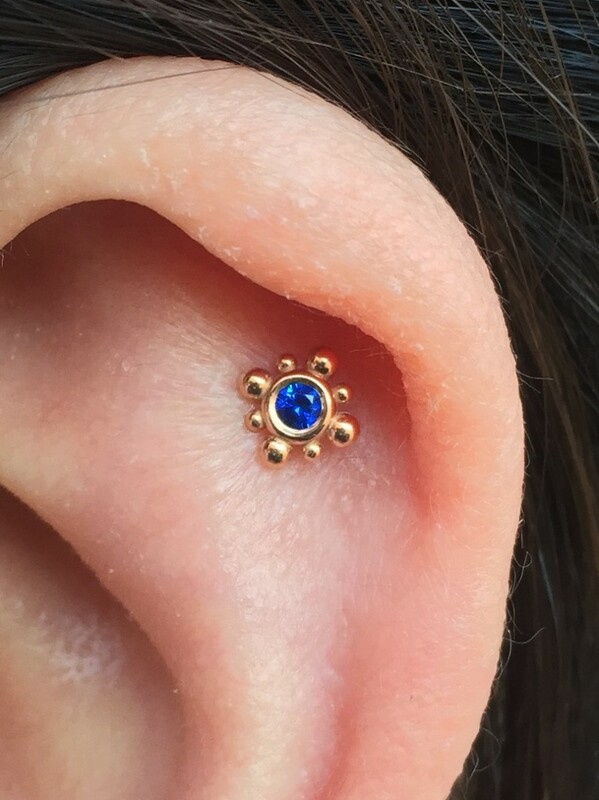 16 one of a kind and incredibly unique conch, daith, and tragus products. We also provide the additional bonus of altering the color of any piece in a wide variety of hues of pinks, blues, purples, yellow, bronze – and more. Stop by for yours today! Open seven days a week for your convenience and body jewelry/piercing needs. 4818 Lee Highway in Arlington, Virginia and treat yourself to yours today! What better way to celebrate starting a new chapter in life than with a refreshing and coveted piercing? 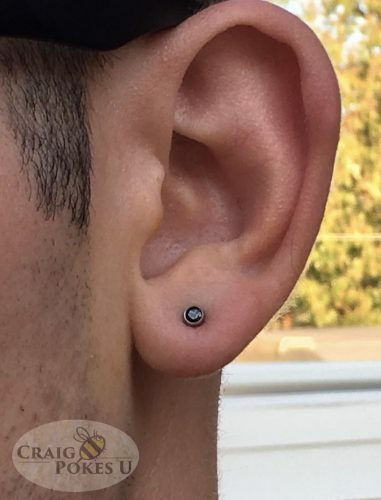 3mm Black Bezel Studs for this gentleman’s ear lobes. 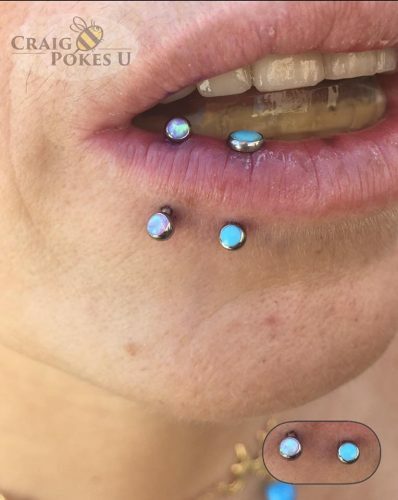 He had wanted them pierced for many years, but was prohibited from wearing them. Thank you for your service and for allowing us to be your first piercers since your enlisting! 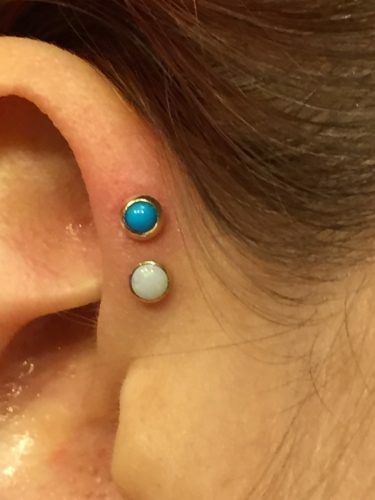 Gorgeous 3mm Capri Blue Opal to compliment this client’s stunning hair. She was ecstatic at the wide variety of gems and stones we had to offer; she found a fondness with this particular one. We at the CraigPokesU Studio are always happy to oblige! 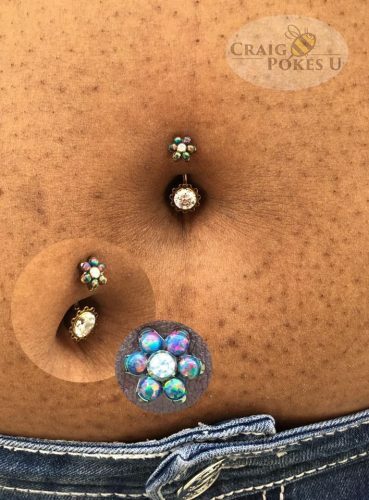 Our client, who had previously had her navel pierced but rejected due to inferior jewelry quality, came in and made the informed decision to upgrade to our implant grade titanium option. 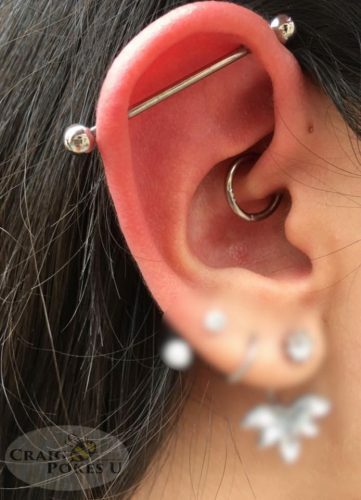 There are many people who have severe reactions to jewelry with high concentrations of nickel, such as stainless or surgical steel – or especially the variety of mystery metals sold at malls and online. Reactions ranging from itching sensations to large and unsightly irritation bubbles to full on rejection from skin. To avoid this, while we do offer implant grade stainless steel alternative, we primarily stock implant grade titanium (ASTM F – 136) – a 100% pure metal – safe for your skin. There is nothing your body can physically have a reaction to. At CraigPokesU, we strive to provide you with not only quality service, but quality jewelry as well. Stop by the studio at 4818 Lee Highway in Arlington, Virginia and treat yourself to yours today! Full Range of Designer Tops and 14 Karat Gold Restocked! 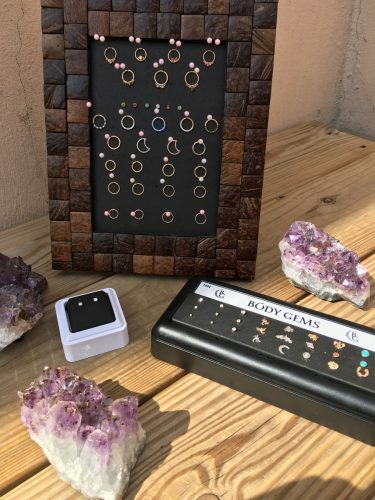 We are happy to say that we are fully restocked in our Designer 14 Karat White, Yellow, and Rose Gold tops, seam rings, clickers, and the highly coveted Lunears! 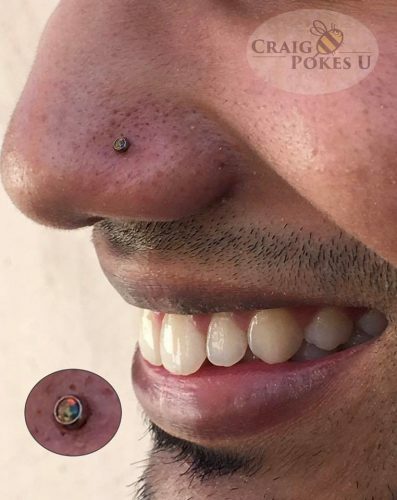 Here at the CraigPokesU Studio, we not only give you the option to adorn your body with 100% safe, quality jewelry; we give you the option of free customization on certain products. We house a special machine (Anondizer) which forms an oxide layer on the surface of quality jewelry through electricity. Changing the electrical voltage changes the thickness of this layer which causes the different shades, hues, and colors seen here. This process extends the decorative opportunites on certain quality metals we stock. The additional perk to anondization is that it forms a cleaner and more durable surface for the jewelry selected by removing microscopic debris through passivation. Anondizing is a safe, quick, and beautiful process we are able to perform for you in house. 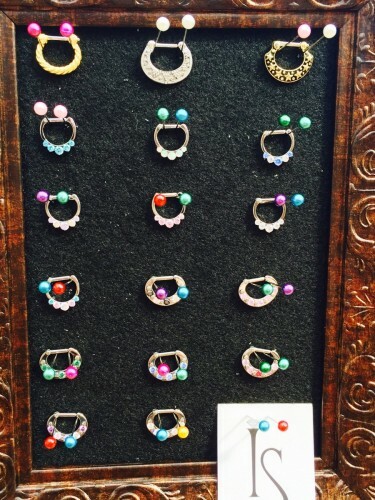 Come create your own special and unique piece today at 4818 Lee Highway in Arlington, Virginia. Treat yourself to something beautiful AND good for your body! WE ARE WELCOMING A NEW MEMBER TO THE TEAM! 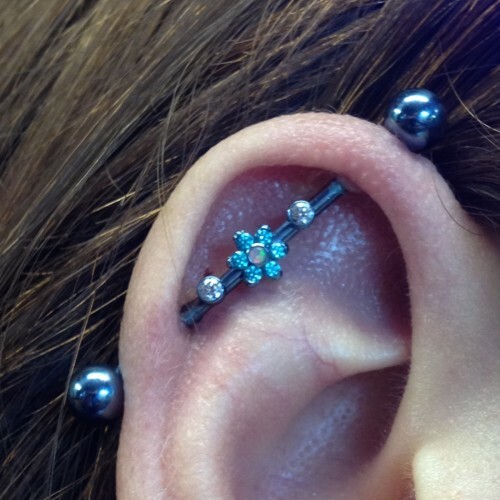 Beginning July 27th CraigPokesU will have a new piercer! 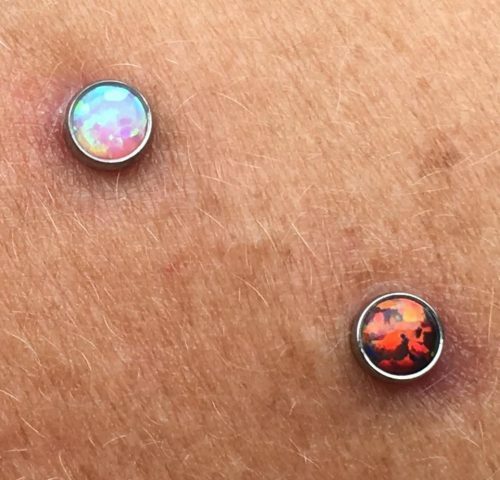 Blake Williams has been piercing for parts of two decades in Alabama. He is going to bring his talent as well as his southern charm and hospitality for us to enjoy! Blake will be here on Mondays, Tuesdays and Wednesdays as well as helping me out on Saturdays. Stop by and say hello and let him adorn you with our beautiful and safe implant grade jewelry! TREAT YOUR BODY RIGHT! 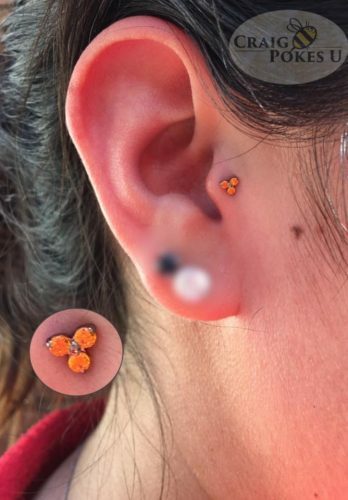 ALWAYS WEAR SAFE JEWELRY! 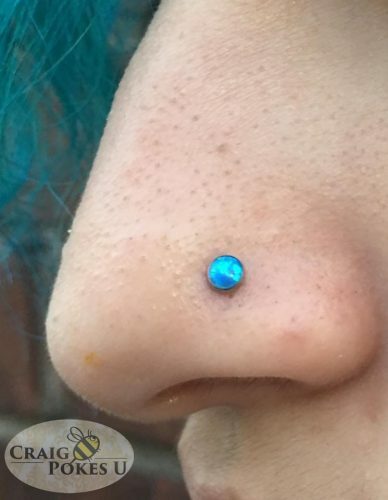 A young lady recently stopped in to have her nostril jewelry changed. The photo on the left is what I removed from her nostril. Due to the fact that the ring was not completely closed, it was not going all the way through the piercing causing it to close without her knowledge. 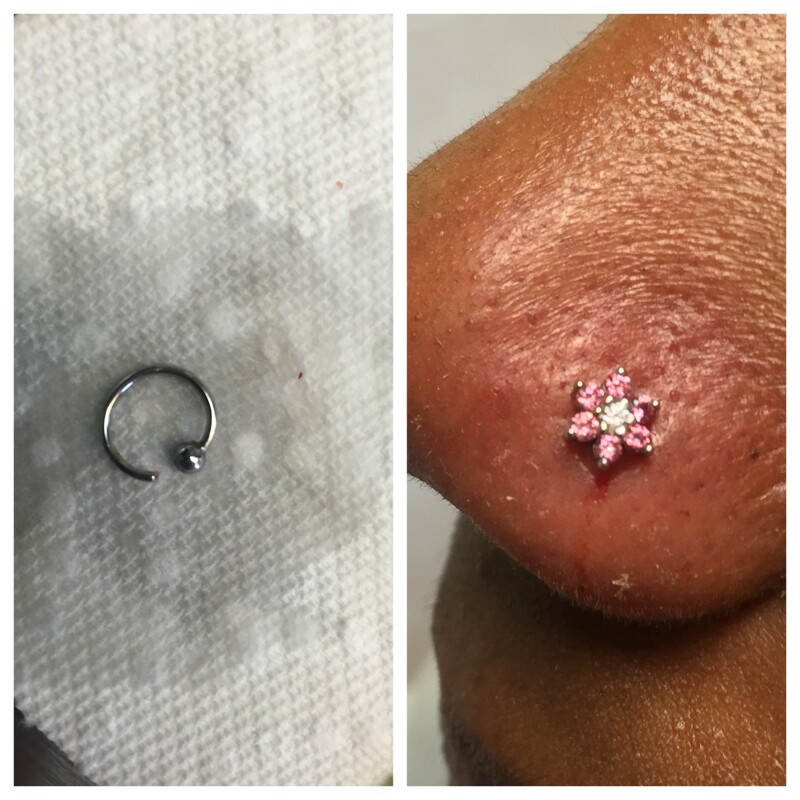 To her surprise, after removing the old jewelry, she needed to have it re-pierced in order to insert the new jewelry. The story does have a happy ending though! 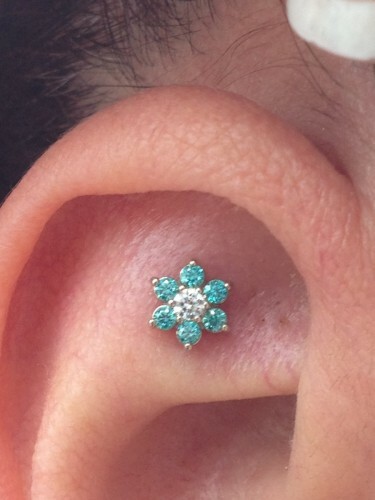 Look at the beautiful new white gold and cz jewelry she has courtesy of the folks at Body Gems! 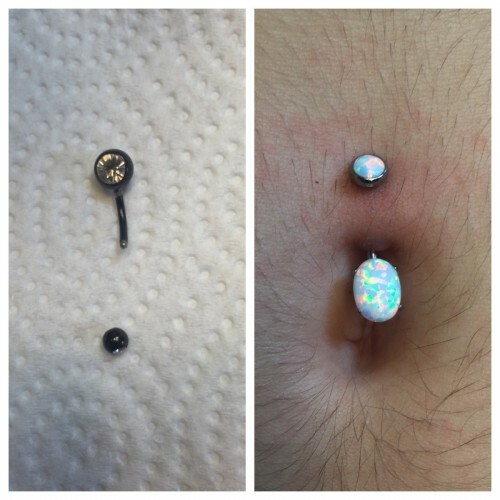 PLEASE CHOOSE SAFE BODY JEWELRY!!! 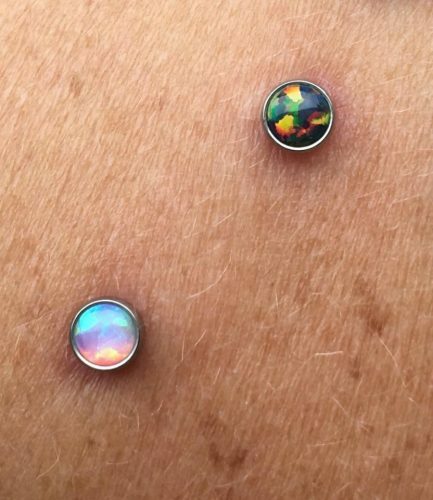 A young lady stopped in to tell me she had been pierced over a year ago at another shop and it has been “infected” 3 or 4 times since. The picture on the left is the jewelry she had been wearing made of a mystery metal and painted black. The picture on the right is the beautiful and safe implant grade titanium navel curve from ANATOMETAL that she purchased to replace it with. 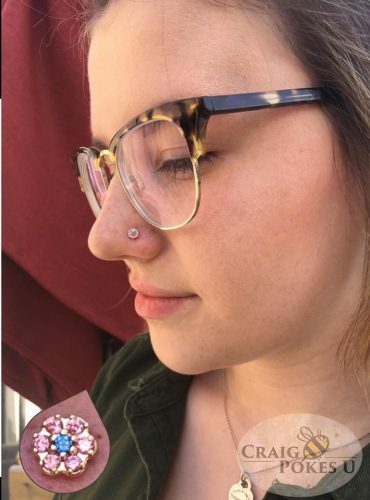 Now she can enjoy her piercing for years to come. PLEASE treat your body right and use only the best!!!! INDUSTRIAL STRENGTH CLICKERS ARE HERE! 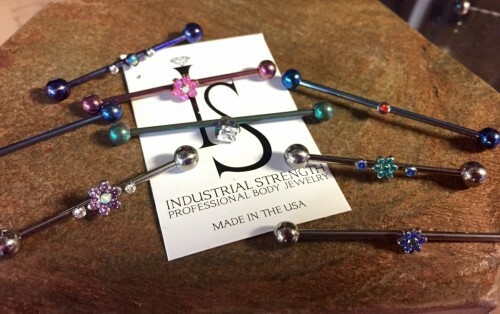 I have just received a huge shipment of titanium clickers from Industrial Strength to my piercing and body jewelry studio located at 4818 Lee Highway in Arlington, Virginia. 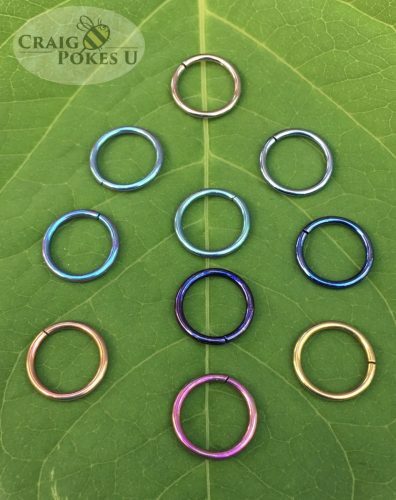 These are perfect for septums, daiths and rooks! Stop in and get one while they last!